The gnomes got to my stash of red currants in the night. Not really, it was my kids. I would have thought they were too tart for their taste. I'll have to try making the sorbet another day. 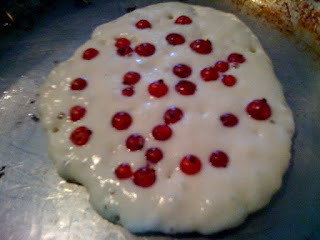 I can't be too sad because these red currant pancakes were muy delicioso. They were perfect topped with homemade strawberry freezer jam.